When your loved one spirals out of control with their drinking, they can become addicted to alcohol. Drinking alcohol is a socially acceptable thing to do. They volunteer to drink initially by drinking cocktails and beer on a Friday game night. Alcohol can be an easy substance to get addicted to since it’s a legal substance and is available everywhere. When an addict continues to drink for stressful work conditions or depression, alcohol could start affecting a person’s behavior. Read on to learn more about the different ways to help your loved one get the help they need. Not being able to control their drinking habits. They tell you and themselves they want to quit drinking but are unable to. Your loved ones have stopped doing other activities in exchange for drinking alcohol. The alcohol substance makes your loved one lack their usual liveliness and focus. They continue drinking alcohol even when this causes other issues such as health risks, relationship problems and more. Of course, every person is different so alcohol abuse could affect your loved one more than someone else. However, it’s important to determine if they are becoming addicted to alcohol. You don’t want it affecting their health or behavior. You might wonder what you can do next to help your loved one seek the help they need. An intervention is a great way for alcoholics to see how their drinking is affecting their loved ones. When you see signs of your loved one becoming addicted to alcohol, you can do an intervention. An intervention can help them see how their actions are affecting you and everyone in their life. Start your intervention by gathering friends and family affected by your loved one’s drinking. Having a date and time set can be beneficial so you are not putting it off to a later date. Some people consider having an interventionist at the intervention. They are there to guide you through the intervention process and can add more help to you and your loved one. Being organized can help the process go more smoothly than an ill-planned intervention. At the intervention, family and friends can help the alcohol addict see their actions in a new light. The alcoholic might not realize how destructive their drinking has become. Loved ones can share their own personal stories about the alcoholic’s behavior while under the influence. Everyone hopes their intervention helps their loved one seek help after it’s over. Yet, it’s not always immediately effective. It could take some extra time before they finally admit they have an addiction they can’t fix on their own. Throughout the process, your support means everything to your loved one. What Happens When Your Loved One Doesn’t Seek Treatment? You might have tried telling your loved one the truth about the effect drinking has on their life. Then, if that didn’t help your loved one seek outside help, you might have tried an intervention. We all hope interventions work, but sometimes they don’t. Maybe your loved one thinks they can stop drinking all on their own. There are lots of reasons they might continue to deny seeking help for their addiction. Some people think that there is only so much they can do when their loved one becomes addicted to alcohol or drugs. What most of you might not realize is that there’s always a way for your loved one to recover from this addiction. There’s always a new treatment being made that might help your loved one’s alcohol addiction. Don’t give up on them. There might be rough patches in the road to their recovery, but remember, your loved one is still in there. You just need to keep supporting them the best way you can. Being addicted to alcohol is a life-long battle. They have to continue to fight the urges to drink during stressful times in their lives. Providing professional help can get them through those difficult times. Before researching the best type of rehabilitation treatment for your loved one, you might want to try convincing them to detox in a medically supervised environment. It’s very important to seek medical help when anyone is detoxing from alcohol. Do you know why? Some people might not know how dangerous the detox process is for alcohol. There are some serious withdrawal symptoms to watch out for, so it’s really important to detox under medical supervision. Medical staff can help take the pain away and watch over your loved one during their detox process. This is especially important with alcohol withdrawal, since it can lead to some life-threatening symptoms. According to Alcohol Rehab Guide, an alcoholic going through detox can experience some mild symptoms such as sweating, headaches, nausea, anxiety, and insomnia. 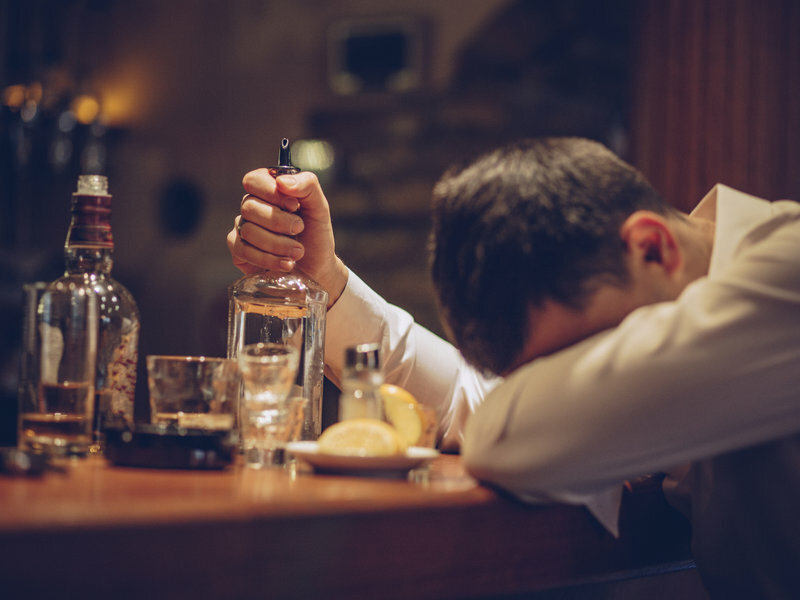 In addition to the mild symptoms, you can experience more serious alcohol withdrawal symptoms, which are tremors, disorientation and extreme hallucinations. Other reasons to seek medical treatment during alcohol withdrawal include two serious symptoms: seizures and delirium tremens. These types of symptoms can be life threatening. It’s crucial to seek medical help during this time; so experienced professionals can help them through the pain and watch over them. No one wants to see their loved one struggling through withdrawal symptoms. It’s always safer to have them in the care of medical professionals. Therefore, if your loved one is refusing to seek any medical help, try to convince them not to do it alone. By explaining to your loved one that alcohol withdrawal can become a serious matter, they might understand how serious the detox process is. They might listen to someone who cares about their well-being. It’s a good sign when an alcoholic decides that they need help. However, sometimes life and money get in the way of getting the proper treatment. There are two types of treatment programs for alcoholics: inpatient and outpatient treatment. Inpatient treatment is great for those who are extremely addicted to alcohol because the addict lives in the residential rehab facility for a period of time. Inpatient treatments can be a lengthy process, depending on the individual’s addiction. As reported by Start Your Recovery, some stay in these facilities for twelve weeks, while others can live in them for a year. These places tend to be stricter than outpatient programs. If you are seeking treatment in Phoenix, Arizona, consider Recovery in Motion, Phoenix. They have excellent inpatient and outpatient treatments available. Try to figure out which type of treatment is best for your loved one. Outpatient is great for those who can’t afford those high bills in an inpatient treatment facility. It can also be a good way to get alcohol addiction treatment for those who have a family or job. Many people can’t afford to stay for months in a treatment facility due to money, children or a job that won’t let them take the time off. According to Start Your Recovery, outpatient treatment isn’t as intensive as inpatient treatment. Yet, your loved one has still got the group and individual therapy sessions needed to help them stay sober. If you think your loved one is becoming an alcoholic, make use of this blog post to help guide them to sobriety. Remember; don’t give up on them, because your support and guidance can be the key to get them through their alcohol addiction. You can help them by showing your support and organizing an intervention. No matter how hard they refuse, keep trying to convince them to seek medical treatment during their alcohol detox. Their life could be in danger if they experience serious symptoms without medical supervision. It’s not easy so you might have to continue supporting them. Whichever type of treatment you think your loved one needs, make sure you both remember that the roadblocks aren’t over with alcohol addiction. Sobriety is a lifelong process.